In 2004, API Equality – Northern California formed as a response to a 6,000 person anti-marriage equality rally held by Chinese Christian leaders. 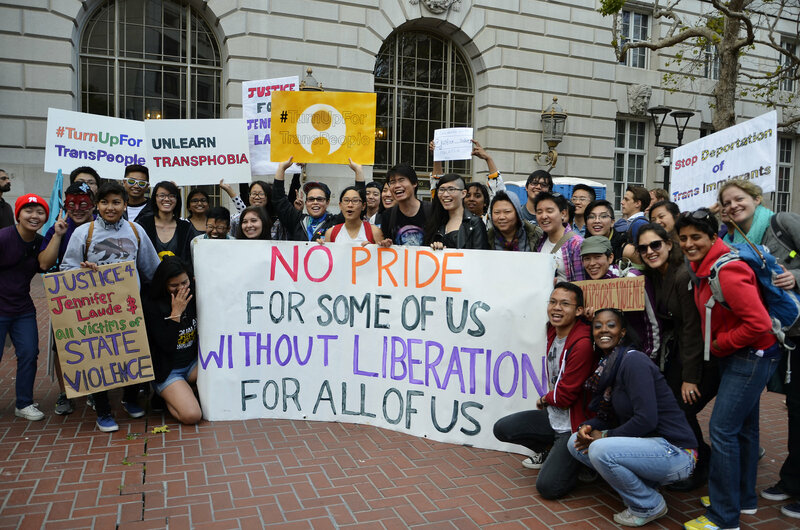 API Equality – Northern California, previously called Asian Pacific American Coalition for Equality (APACE) and then Asian Equality, was originally a national ad hoc coalition of LGBTQ API people and our allies to educate, organize and advocate with and for LGBTQ API community members. Our inception as an organization came out of a specific moment in time–a time in which our community wanted to feel safe, affirmed, and validated in our homes, with our families, and in our bodies. In the 11 years, that need has not changed, but our organization has used a range of strategy and programs to meet the diversity of experiences within the LGBTQ API community in the Bay Area, and nationally. Between 2004-2008, API Equality – Northern California built local and national connections with API and LGBT organizations to secure marriage equality. During this time, the focus of the organization was to mobilize the API community to support marriage equality legislation, while generating media coverage in API and English media to support LGBT families. In 2007, API Equality – Northern California became fiscally sponsored by Chinese for Affirmative Action. After California’s Proposition 8 passed and was deemed constitutional by the California Supreme Court, API Equality – Northern California decided to place an emphasis on a wide array of intersectional issues, including but not limited to marriage equality. The objectives of API Equality – Northern California were two-fold: 1) to reduce and eliminate prejudice and oppression based on gender and/or sexual orientation in the diverse ethnic communities of the API populace and; 2) to combat and eliminate racial-based and/or xenophobic prejudice and oppression in the LGBTQI community. The 2009 Steering Committee, composed of representatives from organizations like API Family Pride, API Legal Outreach, the Asian Pacific Islander Queer Women and Transgender Community (APIQWTC), and the Gay Asian Pacific Alliance (GAPA), brought together a diverse coalition to reshape how API Equality – Northern California thought of its model of organizing and community building. Additionally, API Equality – Northern California began to partner with Asian Americans for Civil Rights & Equality (AACRE), a network of organizations dedicated to helping progressive API organization advocate for justice in California. Changes in vision, mission and leadership brought changes to programming: between 2009 and 2012, API Equality – Northern California started focusing more on storytelling, youth leadership development, videography, and art support spaces. All of these programs worked to build LGBTQ API community power by creating pipelines of support for social change makers. Image description: graphic recording that illustrates “How we Learn & Share” at APIENC. Currently, the mission of API Equality – Northern California is to “amplify our voices and increase visibility of our communities. We inspire and train leaders, establish intergenerational connections, and document and disseminate our histories.” We envisions a world where lesbian, gay, bisexual, transgender, queer Asians and Pacific Islanders can be present and affirmed in our families and communities as our full authentic selves. By focusing on cultural change through visibility, leadership development, and strong alliance building, we hope to create supportive communities, fueled by values and holistic social change. As of 2015, our two main programs are the Dragon Fruit Project, an intergenerational oral history project that documents and disseminates the stories of LGBTQ API activists, and our Leadership Development work, which trains rising LGBTQ API activists and organizers with the skills and knowledge to educate, agitate, and organize our communities. Image description: A group of APIENC volunteers and supporters posing at the 2015 SF Trans March, holding signs and banners.